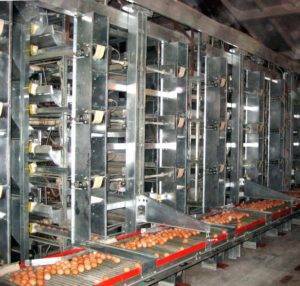 The Elevator 2014 System receives and collects eggs directly from the belts, tier by tier. 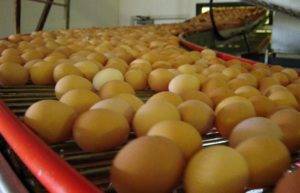 The eggs are accepted by a series of concave “combs” that run from the bottom toward the top of the system and then curve around the top and are ejected on a table or rod conveyor. Keep your eggs as clean as possible with the Egg Collection Lift System. It guarantees only one transfer: from the transport belts directly on to the cross conveyor. The rod conveyor is accurately lifted to each tier by means of a sturdy lifting roller chain and is controlled by precise microswitches and a brake motor on the master column. The electric panel controls the revolution counter (set according to house length) and the egg collection sequence tier by tier. Signal lamps indicate the position of the conveyor. An optional frequency converter with override switch controls the speed of the belts (5 – 20 ft./min.) and can be manually operated with a potentiometer or automatically operated by an egg counting system. Egg collection belts are made of reinforced polypropylene and are available in 4- or 5.5-inch widths. The belts are not sensitive to temperature or humidity variations. Prevent your eggs from collision with an optional egg saver. It stops the eggs just before they reach the egg collection channel to reduce the speed and avoid collisions with eggs already on the belts. The system is controlled by a time clock and a timer and it is possible to set the number and duration of operations. Protect eggs from pecking with an effective (but not dangerous) electric wire. The wires are connected at one end to a switch box where it is possible to switch off each single wire or one complete cage bank. 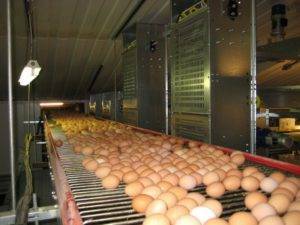 Top-quality rod curve conveyors move eggs efficiently from one area to the next while limiting impact and collision. It features elbows from 7° to 180° and up or down slopes up to 28° depending on conveyor type. To suit capacity or packer or grading machine, the width of the conveyor ranges from 10 to 30 inches. Galvanized conveyor rods are standard but options of epoxy-coated or plastic-coated rods are available.